I have been a pastor now for nearly 36 years, but prior to this I was a police officer for 14 years. I have always missed those police days, and I want to tell you the chief reason why — we were all certain whose side we were on and who the enemy was. When I became a pastor I found that certainty and the unity it produces are largely non-existent in many if not most local churches. Christians do not seem to be on the same side. They do not recognize the enemy. They have foolishly allowed the enemy to infiltrate them. They are not united and lack a sense of “we all wear the same uniform here and have the same badge.” So when the enemy comes along he is not faced with a united team standing together but rather a bickering, doubting, confused group that is rather easy to conquer. Every day when I went on patrol, I wore my uniform. I had a marked police car. I wore a badge and I enforced the laws of the State of Oregon. So did every other police officer in our department. Oh, sure there were some personality conflicts among us and once in a great while a phony would creep in among us but would eventually be “outed.” But when it came down to it, when the fight got intense and the danger loomed, we all stood together. All of us. If you called for backup, you knew it was coming — and fast. I was a police officer on Friday in the midst of all that unity. On Monday I was a pastor, never to experience that camaraderie again for 30 years. Why? Because as I found, Christians do not have a sense that they all wear the same uniform, display the same badge, follow the same Law, and have each others’ backs. Nor do they grasp who their enemy is, what he looks like when he shows up, and what tactics he uses. Part of the problem of course is that many “Christians” are not Christians at all but false professors and hypocrites. And of course the enemy we face is far more crafty in his disguise than the burglar who breaks in or the armed robber at the bank. Nevertheless, we are without excuse. As a police officer, I received slaps on the back and commendations when I busted a crook. Yes, we had to deal with complaints lodged against us and sometimes we were wrongly disciplined, but all in all there was positive reinforcement to do a good job. One time a service station clerk faked an armed robbery and pocketed the cash in the till. He then called the police and acted terrified, describing the robber and the gun the guy held on him and so on. Long story short, I figured out he was lying. Under some pressure (I know you are lying and if you don’t fess up now you are really going to jail for a long time) he caved. Yep, he and his buddy staged the whole thing. We found his buddy, arrested him too, and recovered the money. What happened when I became a pastor and busted a bad guy in the church? You all know without me even having to tell the stories — and there were many of them. I felt all alone. No backup. Turns out the supposed comrades of mine were standing with the crook. And THIS is precisely what happens to abuse victims in churches when they bust their abuser and tell what is really happening. No sense of “we are in this together.” No clarity regarding who the enemy is. So the righteous are called unrighteous and the wicked are justified. And now you know why so many times I almost returned to the police department. Things ought not to be this way among Christ’s people. I fully understand why you at times felt you wanted to go back to the police department Pastor Crippen. People will do evil things and the witnesses turn into cowards and will not side with the one who is in the right. And we know we are in the right because the word of God says that we are. I have been the scapegoat for my extended family through the years. I have had a pastoral counselor point this out to me with all of the evil ganging up on me behavior. And not ONE of them who calls themselves a Christian will stand up for truth and righteousness according to the word of God. I have had to go no contact with most of them for my own safety. The Lord specifically gave me this bible verse years ago about what He thinks of this. We are extremely glad that you did not go back to the police force. It is a enormous blessing to have you on our side! Of course, another excellent post! If only you, Pastor Crippen, had been MY pastor 10 years ago when my abusive-then-husband thankfully-now-my-ex, walked out on me and our two boys in this grand scheme to make me out to the unrighteous, ungodly wife who only wanted a divorce and could never forgive nor forget. Likely, you would have called HIM out for his evil ways and not put the burden, once again, on my shoulders to salvage a marriage that was shattered years before or pressure me to stay so my abusive husband would be saved from his wrongful ways. For years I had the burden placed on my shoulders by the church to keep my marriage together because I was told God hates divorce and it was my lot in life to stay. If only I would speak softer, respect him in all thing, submit to him in all things no matter what he asked or wanted and would finally see that suffering through abuse was the righteous thing to do — then my marriage would get better. If only…. And then when he walked out 10 years ago it was once again my burden to salvage that marriage and never ever once think about divorcing him because that was a sin all of it’s own. Nowadays, I say poppycock to all that nonsense and truly do wonder how other so-called Christians get it so backwards when it comes to abuse. Rallying around the abuser trying to ‘save’ him from his wicked ways or just feeling sorry for him because his wife refuses to see how down and out he is, and then turn away from the victim because she must not value marriage enough to stay put and just make it work. It’s so refreshing to see a pastor sharing the truth about abuse, thank you! Poppycock! It is! All of that junk. I love this verse. I hope to say it to my abusers flying monkeys when and if I ever am able to safely and victoriously confront them. Pastor Crippen, thanks for sticking it out! You articulate what’s going on in today’s visible church so very well. I knew of narcissists in church after finding out about the condition myself but had trouble finding exposition on the topic. As you say, it’s “off our radar.” You helped me to see the applicable verses and even how to view the old testament. Much appreciated! In many of our situations justice has not been denied simply delayed. I’m thankful someone recommended your blog. So many helpful articles. I am a blogger, writing a series on narcissistic abuse (and especially how some churches don’t want to/don’t understand how to deal with it.) I’ve been walking closely beside several women in these marriages–one still in, and one just divorced. I also have a close family member who is narcissistic. But all the traits of narcissism are with her, and all the traits of a peace-maker are with him. Just wondered if that’s very common and how do we discern if we are supposed to believe everyone who claims abuse? Kelly – Other than the fact that in this case the wife is the abuser (usually it is the husband but by no means always), the scenario you describe is very, very typical. Deception. Playing the victim. Isolating the target from outside support such as family. Gathering allies from willfully blind and naive people. So yes, I would say this is very, very common. As to how we discern – genuine abuse victims are first of all very hesitant to tell anyone. After all, they aren’t even clear on what is happening to them themselves, so deceiving and fog-casting is the abuser. And in particular, victims who are Christians have generally been trying and trying and trying for years to make the marriage work. Trying too long, actually – largely due to their church’s false teaching. But there are other reasons as well – fear, children, lack of finances and so on. 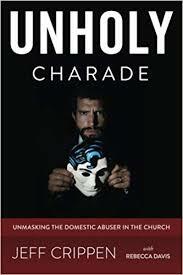 Genuine abuse victims, again especially Christians, are hesitant to be critical of their abuser. Someone for instance who readily tells everyone what a jerk their spouse is does not fit the normal pattern of a real victim. A real victim does not “play the victim” trying to actively garner everyone’s pity. These are some of the ways that you can discern the true from the false.